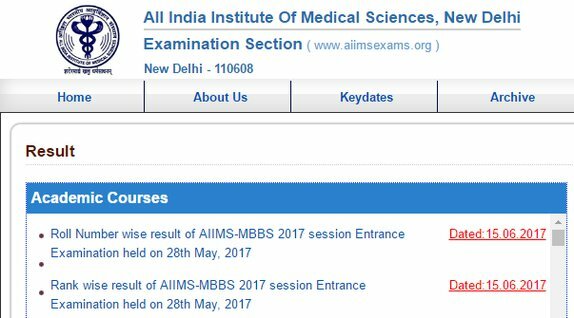 The All India Institute of Medical Sciences declared MBBS results today, June 15, 2017. The exam was successfully conducted on May 28, 2017 across various centres in the country. Click here or visit https://www.aiimsexams.org/info/Result_new.html to check if you have made it to the first round of counselling. The total numbers of candidates eligible for the 1st round of counselling are four times of actual number of seats. Only if the actual numbers of seats are not filled from the candidates called for the first round of counselling, shall there be subsequent rounds. Further, for allocation of seats, physical counselling will be done. Candidates will exercise their choice of the Institute when called during the counselling as per their rank in their respective category. Choice thus made will be final & no claim will be entertained in this regard thereafter. All candidates may view/download their results in the website www.aiimsexams.org. In addidtion, are advised to visit the website regularly for further latest updates including counselling schedule and dates etc. The counselling letter will be uploaded on the website in due course, the same can be downloaded from the website. No individual letter will be sent by post. Thus, the candidates are also advised to carefully read the instructions as given in their counselling call letter.